Ellsberg (Matthew Rhys, The Americans, Brothers and Sisters) was working for the Rand Corporation on an evaluation of U.S. progress in the Vietnam War. Official pronouncements about the war’s success were dramatically at odds with what actually was happening on the ground based on what Ellsberg observed. He subsequently leaked volumes of classified documents to The New York Times reporters Neil Sheehan, Hedrick Smith, and E.W. Kenworthy. The federal government sued the Times, attempting to shut down further reporting on the classified documents. Ultimately, the Supreme Court sided with The Times and upheld the principle of Freedom of the Press. The Times won the Pulitzer Prize for public service in 1972 for its reporting. How does The Washington Post fit into the story? The Washington Post was hardly a major national player. Known more for its close personal relationships within the Kennedy and Johnson presidential administrations, the newspaper was certainly not in the same league as the Times journalistically. But the leak, and the controversy, came at a pivotal time in the Post’s corporate and journalistic evolution. While the Times scooped the Post (and everyone else), the nation’s capital newspaper ended up playing a critical role in the fight for the First Amendment. When the federal government ordered the Times to stop publishing articles based on the Pentagon Papers, the Post continued to report on the source material using an independently secured copy. The federal government issued a cease and desist order to the Post, too. The two cases were consolidated under The New York Times Co. vs United States (403 U.S. 713 (1971). The decision to keep publishing was not an easy one. Katherine Graham (Meryl Streep, Julie Julia, The Devil Wears Prada, The Iron Lady) inherited the newspaper after her husband committed suicide, and she had little experience in business or journalism. She was known more for her high-society socializing with powerful politicians than her business sense. The legal and corporate challenges tied to reporting on a precedent-setting scandal forced her to fully embrace her role as a serious corporate executive at the expense of many of these personal relationships. In the film, her evolution tracks with the attempt to take The Washington Post public through an Initial Public Offering (IPO) and trade on the American Stock Exchange (AMEX). The paper was using the public offering to raise capital to reinvest in the newsroom and reporting under the aggressive leadership of feisty editor-in-chief Ben Bradlee (Tom Hanks, Castaway, Saving Mr. Banks, Sully). The Pentagon Papers story breaks in the middle of the implementation of the Post‘s IPO. A clause in the offering allows investors to pull out of the IPO if the newspaper experiences an event that fundamentally affects its profitability–like the federal government shutting it down–potentially ruining the company. The screenplay by Liz Hannah and Josh Singer does an excellent job of pitting Bradlee’s scrappy journalistic principles and opportunism against the prudent conservatism of the boardroom represented by board chairman and confidant Fritz Beebe (Pulitzer prize winning playwrite Tracy Letts, The Big Short, Elvis-Nixon, Lady Bird) and Arthur Parsons (Bradley Whitford, Get Out, Saving Mr. Banks, The West Wing). Ultimately, Graham has to make the call, a decision that marks her transition into hands-on corporate leadership. 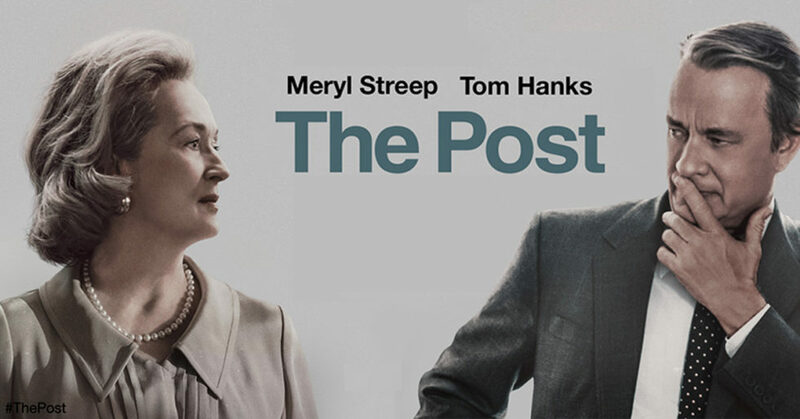 While marketed as a political thriller, The Post ends up as a gripping adult coming-of-age drama. The story of Graham’s ascendance in the male-dominated world of corporate journalism, the Post’s emergence as a national player in investigative journalism, and the changes in the news industry wrought by government misdeeds are important stories to tell. Directed by Steven Spielberg, the movie hits all the right notes in a tight, polished, and well-produced movie. Meryl Streep, as usual, shows she can step into almost any role and own it. Hanks’ portrayal of Bradlee is a bit uneven, but the supporting cast, Spielberg’s tight direction and attention to detail, and layered insight into high-stakes corporate decisionmaking more than make up for any of the film’s minor flaws. The Post movie has been criticized for short changing the pioneering role of the New York Times in the scandal. However, the Times is recognized in the film as the principal player in the unfolding Pentagon Papers story. The reporters in The Post are always chasing the Times, not leading it. But The Washington Post also played an important supporting role in the real life drama surrounding the Pentagon Papers (as the Supreme Court case makes clear). This movie is telling the Washington Post’s story, not the New York Times’ version. The Post movie is about more than political scandal. The film is also about cultural shifts, the coming of age for a major institution in modern-day journalism, and the tensions that sometimes emerge between corporate expediency and a company’s core values. The vehicle for telling this story is a noble effort to protect Freedom of the Press and ensure government transparency for its citizens. The Post ends up being a worthy mechanism for ensuring the First Amendment and the principle of Freedom of the Press stay in the forefront of the public consciousness, a goal particularly relevant to today’s political climate.